This is thoroughly updated for the twenty-first century. 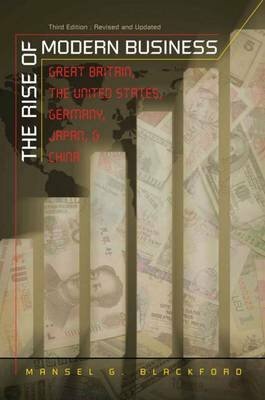 ""The Rise of Modern Business"" compares and analyzes the development of business and business institutions in several countries from the preindustrial era to the present. Paying close attention to connections between business development and political, social, and cultural changes, Blackford addresses both manufacturing and nonmanufacturing firms, small firms as well as big businesses. For this third edition, he updates his study in light of new scholarship, with special attention paid to the structural diversity of business firms and with a timely discussion about the reciprocal relationship between business and the environment. The business history of Germany is extensively updated, and there is entirely new coverage of the business history of China, a country whose growing political and economic prowess on the world stage demands the historical and contextual understanding of business scholars today.